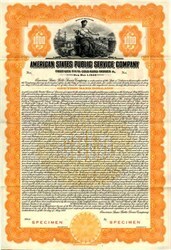 Beautifully engraved RARE Specimen $1000 Gold Bond Certificate from American States Public Service Company Gold Bond dated 1928. This historic document was printed by Columbian Bank Note Company and has an ornate border around it with a vignette of an allegorical woman with a dam power plant in the background. This item is over 78 years old. American States Public Service Company was incororated in 1928. The company changed its name to the Southern California Water Company (SCW) in 1936. SCW was listed on the NASDAQ Exchange in 1990. SCW moved to the NYSE in 1993. American States Water Company (AWR) has grown significantly since 1929 when the original water systems were acquired. Yesterday's visions have developed into today's reality � a viable service provider focused on the needs of over one million people throughout California and portions of Arizona with affordable rates. In 1998, the growth trend continued when American States Water Company became the parent company of a new subsidiary dedicated to the non-regulated water industry, American States Utility Services, Inc. (ASUS). American States Utility Services, Inc., assists communities by providing options for lease or purchase of tailored service contracts ranging from meter reading, customer service, system maintenance, and full operations options.